There is no color allowed in this family's home. Theirs is a cult of khaki, a wasteland of white. Their mission is to match. Every inch, every item, every tooth, every person, must be white and well-lit. There can be no dissent. And when they have scourged all color from their world, they must play, wholeheartedly and with full devotion. 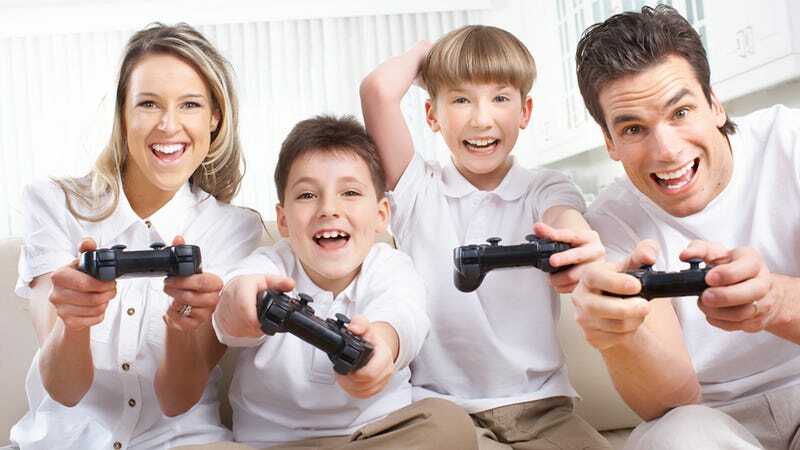 Perhaps they plug their PlayStation into a sepia-toned screen in order to prevent color from appearing in their eerily lily-white home? But play they must. Their cult demands full engagement. They are so in tune with the PlayStation that their controllers require neither wires nor charging ports. Perhaps there is no television at all, but a pristine white wall. Father is a true believer. But Mother... there is sometimes a hollowness behind her frozen smile. And—wait! Those are buttons! And they're not even white! They can be seen! This is not the uniform, madam. Those were not the terms. This cannot stand. That's it, boys. Play. Just keep playing. The game is all that matters.